Super C but no Contra? Odd. They've done a good job getting a little bit of everything for everyone, for sure. This seems nice for if you don't already have a Wii or WiiU. ^ Don't these cost $5 each on there? If someone is interested in these games it seems like the best option. As small as this is, it looks nicely portable. Of course, so is a laptop. Sort of related, this is neat and arguably a better product. But why would I want to subject myself to 80 Sega games. ^^My sister actually owns a Genesis version of that. It's pretty neat, but the wireless controller are really janky. Luckily, you can also plug in regular old Genesis controllers. I have wireless NES controllers, matter of fact. Buttery smooth. After you go past about 30 games, I'm not sure the rest isn't just random filler. Where are the Shining games? Have there been 80 good Sega games? Ever? dID YoU KnOw tHat thE DreAMCast haD ThE beST RaTio oF GooD GAMeS to bAD GaMEs EVER??! That would be way too easy if we took all Sega games into consideration, even just the ones released on their own consoles. There's probably nearly 80 good games just between the Sonic, Shining, Virtua, Shinobi, and Phantasy Star franchises alone, really. From what I've heard, the Genesis with 80 games has poor sound emulation and poor controllers. I meant face buttons specifically. I have a hard time properly utilizing the top buttons in Fighting games and had a Street Fighter six-button controller I liked more than the standard PS3 one. Since it's one of my favorite genres I like that button mapping more, personally. I feel that. 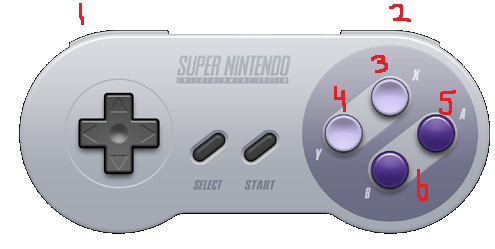 I always wondered why the Heavy Punch and Heavy Kick were auto-mapped to L and R on the SNES versions of Street Fighter, since that seemed to be the most awkward placement for them.